Last week I received a gift card to Smoothie King (SK) from my chiropractor for referring someone. I have never been to a SK before, so, I thought, why not! Hubby and I stopped by one on Sunday. As I was looking at their offerings I saw a lot of fruit smoothie options, although all of them had some kind of nasty protein powder added. No worries, I was going to have them hold it. “Do you put actual fruit into your smoothies?” I asked SK’s employee. “Yes, absolutely!” was his response. So, I ordered my smoothie… and then watched in horror as he pumped some kind of syrup into the cup, added ice and went to blending. Are you kidding me? Do people even know what REAL means anymore? Does anyone in the commercial world make real fruit smoothies anymore? Their smoothie went into the trash, as you can imagine. My husband called it “NASTY!” We got home and I made my very own fruit smoothie, made with real organic ingredients and it was so refreshing and delightful that Sprout downed close to 8 oz. in one setting too. 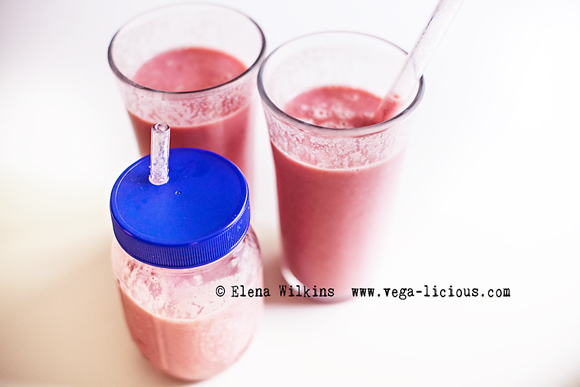 If you have the ingredients, you will LOVE this fruit smoothie recipe.